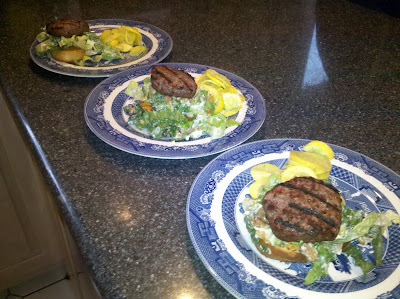 So did anyone out there try our recipe for the Caesar burgers? Winnie and Phinn took over as grill masters last night and whipped them up at our house! To add a little spin on the recipe Winnie and Phinn decided to serve up the burgers up on a slice of toasted baguette and a side of sauteed yellow squash. They were so yummy!! Who says you can't grill in March?? Here are some pictures of the dinner and feel free to share how the burgers worked out at your house!